This is where you find up-to-date information for the current session of the Access program. Workshop and event schedules will be updated regularly. Make sure to check back often to register or reserve tickets. Committees: Find details on current year committees and our Access Alumni Committee Chairs . Workshops: Find dates, event descriptions and registration info on Access Boot Camps, student committee workshops, and more. Events: Find dates, event description and registration info on Burnaby Board of Trade networking events. 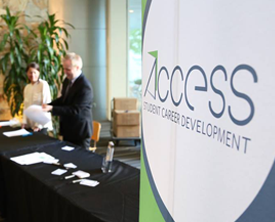 Case Competition: Find out what an Access Case Competition looks like. Details on the business organization and the business problem. Activities Calendar: Overview of scheduled events, workshop, case competition and other relevant dates. The Orientation Kit (download PDF) includes a rundown of the workshops and BBOT networking events, mentor information, FAQ and more.